MT is especially useful for preventative maintenance of critical parts already in service and for finding defects before parts are put back in service. To test with MT, the first step is to magnetize the object being tested by passing an electric current through the component. During the inspection magnetic particles are applied to the surface and any cracks will show up as a result of the particles being attracted to the "leakage field." These particles cluster wherever these cracks are, providing a visual indication for the inspector. The inspector can then assess the extent of damage and provide crucial results to engineers for disposition. MAGNETIC PARTICLE TESTING (MT) IS AN NDT INSPECTION TECHNIQUE that uses magnetism and its principles to find cracks, also known as flux leakage sites, in metals. Using direct or indirect magnetism, MT can detect surface and shallow subsurface discontinuities in steels as well as their alloys. ONE REASON EDDY CURRENT IS A POPULAR NDT TECHNIQUE is that it does not require the removal of paint or protective coatings when testing. ECT also doesn't require you to close down operations to test. Newer technologies, such as EddyFi's Sharck probes, feature tangential eddy current array (TECA) technology and are capable of positioning, measuring, and sizing cracks in carbon steels up to 7mm (0.28"). WITH TECHNOLOGY IMPROVING EACH DAY, ECT continues to provide accurate, non-invasive testing of assets under insulation. As relates to the ECT capacity, when it comes to conductivity, we are primarily focused on the electrons of the outermost shell of an atom. When an atom has 1-3 electrons in the outer shell, the material will conduct electricity when the atoms are pushed by voltage. CERTAIN MATERIALS ARE BETTER CONDUCTORS THAN OTHERS. For instance, according to the International Annealed Copper Standard (IACS), copper is the perfect conductor. This is because pure copper has a base value of 100%. A base value of 100% makes it an ideal material that offers zero resistance and, therefore, is a pure conduit for electricity. Eddy Current - What Is It? Where Is It Used? EDDY CURRENT TESTING (ECT) IS A COMMONLY USED AND VERSATILE ELECTROMAGNETIC NONDESTRUCTIVE TESTING (NDT) TECHNIQUE. ECT uses electromagnetic induction to detect and indicate surface and sub-surface flaws in conductive materials, including both ferromagnetic and non-ferromagnetic materials. It can also be used to detect coating thickness. SPECIFIC APPLICATION AREAS INCLUDE in-service inspection of tubing at nuclear and fossil fuel power utilities, at chemical and petrochemical plants, on nuclear submarines, and in air conditioning systems. If you haven't already, you will have an eye exam upon certification as an inspector. No matter how great the technology is at detecting even the smallest of discontinuities, your eyes still must be able to distinguish the results. NAS 410, ASME Section V Article 9, and SNT-TC-1A require all technicians to be capable of reading a minimum of Jaeger Number 1 or 2 at a distance of 12" for near vision acuity upon initial certification. So, what is visual acuity? Have you ever heard an inspector say 'I can already tell that weld is not gonna pass'? It's because the weld doesn't pass the direct visual examination test, or as we call it, the 'sniff test'. The same goes for the old saying," If it looks like a duck ...". These are all examples of direct visual examinations. Some simple tools used for direct visual examination include welding gages, as seen here being used to check the fillet leg length. These tools, along with the most important tool for visual testing, our eyes, are quality instruments that can determine alignment, dimensions, and indications in all sorts of manufacturing products. Visual Testing (VT), the most common nondestructive testing technique. Offering broad potential for many applications while requiring minimal tools, VT is low in cost and easy to apply, often eliminating the need for further types of testing. It is frequently the first step in the inspection process. Similar to an examination by a physician, visual inspection of the subject is always the first line of defense in determining which further tests are needed to diagnose the problem. Industries that rely heavily on the use an initial VT inspection include structural steel, automotive, petrochemical, power generation, and aerospace. Although VT is limited to surface-only material examinations, it is often excellent at detecting damaging defects. Remote imaging systems require manual interpretation by technicians. And not even the best technology in the world can replace human interpretation and judgment. At the end of the day, it always comes back to what the technician can see. Our VT courses provide you with the knowledge necessary to add this valuable skill set to your toolkit. You can also check out this video with one of our founders, Chuck Hellier, talking about VT. The initial setup of phased array equipment for inspection is the most important task for the NDT technician. Why is it so important? Because to do a proper inspection, you will need to be precise, and the right setup guarantees that. The right setup means you will need to know which calibration method to perform, which probe to use and why, and the characteristics of the material you will be inspecting. And you need to know how to change your calibration each time a transducer or its wedge change. But fear not. Our Ultrasonic Testing courses cover this information and more, ensuring you are thoroughly prepared for your UT inspections. Credit GemsNDT with the incredible photo! Phased Array 101 - When is Phased Array Ultrasonic Testing (PAUT) Required? PAUT is an advanced method of ultrasonic testing with applications in medical imaging as well as in industrial sectors such as construction, power generation, and pipelines. It is particularly useful in the industrial sectors because of its capability for testing a large volume of material, where full volume examination to assess the structural integrity of a design is of critical importance. PAUT is also a required and an effective method for detecting service-related flaws for cracking, corrosion, and de-laminations as well as for assessing welds and wall thickness measurements, doing corrosion testing, and performing rolling stock inspection (wheels and axles). Thank you undisputed_kb for the great photo! Knowing what technique to use, when and how are the trademarks of a successful NDT technician. This image is an example of a standard compression wave technique reflecting sound from the back wall or discontinuities. The image is used to assess the integrity of the test material for service. In order to obtain a reflection, it is necessary for the reflector to be oriented so that part of its surface is parallel to the scanning surface, otherwise known as 'normal' to the beam. Laminar discontinuities and volumetric discontinuities like gas pores and nonmetallic inclusions are all suitably orientated. However, discontinuities that are angled to the scanning surface may not reflect at all or may reflect the sound away from the transducer. This may all sound Greek to you now, but after a thorough explanation and demonstration by one of our UT course instructors, you’ll be understanding pulse-echo technique (and many other UT testing techniques) in no time. The inverse square problem in our recent post asked a question that all RT techs should be able to answer. It not only applies to technique development, but also safety. Since the intensity of radiation is inversely proportional to the square of the distance, the answer is as follows: If I1 = 28 R, I2 = 2R, D1^2 = 9 feet, then D2^2 = 11.2 feet. Try it for yourself and see online training work. An interesting article published on the OPEN EDUCATION DATABASE website presented 10 advantages of taking online classes. The current challenges facing traditional colleges and universities, including higher tuition, budget cuts, and course shortages, have caused many students to search for alternatives. With nearly 3 million students currently enrolled in fully online degree programs and six million taking at least one online course as part of their degree program, online education has clearly become one of the most popular higher education alternatives. The continually improving reputation of online learning has also helped fuel its expansion, as initial skepticism has faltered in the face of evidence that shows that online learning can be just as effective as face-to-face education. Can you answer the question shown in the image above? Just as a good quality test requires a sharp inspector, it also requires a safe inspector. Working with radiation can be dangerous business. It exposes the technician to two types of exposure: acute and chronic. Acute exposure is short-term, high-level exposure. Chronic exposure is long-term, low-level exposure that is usually the result of improper or inadequate protective measures. Both are to be minimized (or, if possible, completely avoided) at all costs. But how? - ALARA: "As Low As Reasonably Possible"
What does that mean? And how do you apply that to radiographic testing? NDT Classroom’s Radiation Safety and Radiographic Testing courses will teach you the answers the these questions and many more. With the help of expert instructors and high-definition videos that demonstrate the most current real-world techniques and technology, you’ll learn how to apply the necessary skills to keep not only yourself safe, but those around you safe as well. 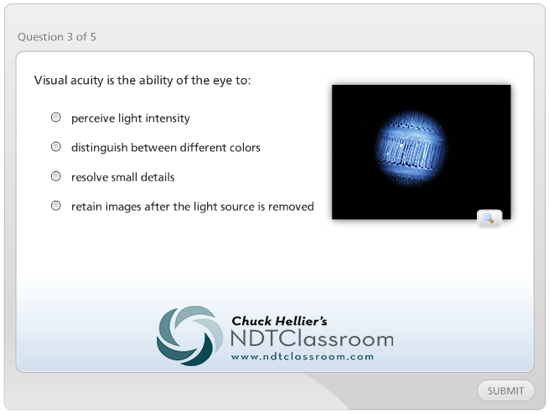 Visit the NDT Classroom website at www.ndtclassroom.com to learn more and see a demo of our courses. WANT TO KNOW THE ANSWER? We'll share it in an upcoming blog post - stay tuned! Besides safety, the ultimate goal of the RT technician is to produce the highest quality radiographic image possible in order to assess the fitness of service of the specimen being tested. Understanding radiographic sensitivity and the characteristics and variables of radiation and film - such as density, contrast, sharpness, magnification, and distortion, and what affects contrast and what affects definition - will help make that possible. For example, overexposure of a radiography will produce darker images, or higher densities. Likewise, material thickness also affects contrast as radiation exposure is greater upon thinner sections than thicker ones. Figuring out the balance between all these factors will help you produce the greatest radiographic sensitivity, further ensuring your images show the highest amount of detail (and are therefore the most comprehensive image) possible. NDT Classroom’s online courses in Radiographic Testing offer an in-depth look at the factors that affect the quality of a radiographic image and how to interpret what an image is showing. With high-def, real-world video examples, the courses clearly demonstrate how you as a technician can handle and maneuver variables to get the best image possible, providing you with the means to create better images. And better images = better understanding of any issues, which then = better chances to get at the root of the problem and fix it. And that is, ultimately, the end goal – accurately assessing and fixing the problem in order to create a safer world for all. Want to learn more about imaging factors and radiographic testing? Click here for an overview of NDT Classroom's Level I and Level II courses. Radiographic testing is an excellent NDT method to learn, as it offers many advantages over other NDT methods for specific applications. For one, it can be used on a variety of materials and requires very little surface prep. It is also highly reproducible and often uses portable systems, making it easy to use in elevated positions and in the field. However, it does not come without its drawbacks, such as the potential for health risks if tests are not performed with the utmost care. But administering tests well and being able to produce a high-quality radiograph is only half the battle. RT Technicians also need to be skilled in interpreting and evaluating the results of the tests they perform. To do so, they must be able to rely on their visual acuity and understand the roles that effects and scattering play in film interpretation. If there are discontinuities present in the test material, they will affect the amount of radiation that passes through. For example, x-rays or gamma rays will pass through porosity with relative ease as compared to the other solid parts of the same material. This will create a higher exposure and result in a darker region of the finished radiograph. This specific, hands-on knowledge is the kind of information you can expect from the Radiographic Testing courses offered by NDT Classroom. Led by industry expert Gary Larson, NDT Classroom’s Radiographic Testing Levels I and II courses take you through all the knowledge and steps necessary to lay the foundation for becoming a highly skilled radiographic technician. Not only do they provide the know-how, though; they give you the confidence you need to do the job with the highest level of safety.